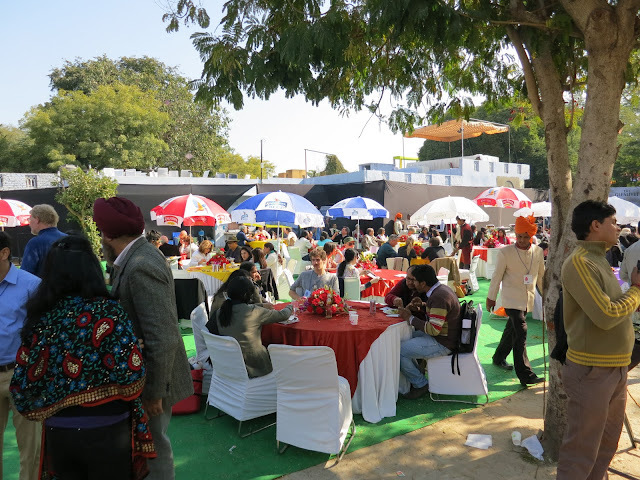 Today was the 5th and final day of the Jaipur Literary Festival. It certainly was the most politically and religiously charged day of the festival. We definitely plan to return next year. At any given time there are 5 different venues going on. We plotted out what we wanted to attend, and planned to arrive about 10am. There was a 3:30 seminar on the great Persian Sufi poet Rumi, and we definitely planned to attend it. When we arrived at the venue, the Rumi panel that was scheduled for 3:30 was starting at 10am. We attended it and totally enjoyed it. Rumi, the greatest of all poets is very difficult to translate and understand. The translator is faced with dilemma, should he try to make rhyming couplets or translate it in free verse. Two of the most respected Rumi scholars were in attendance and recited Rumi poems in couplets. They were a joy to listen to. We can hardly imagine what they were like in their original Persian, Turkish or Greek. Rumi wrote over 3,000 poems containing over 30,000 lines. He is far and away the most important poet to these people, even though he lived 700 years ago. We then attended a fantastic lecture by William Dalrymple one of the co-heads of the festival. We have read many of his history books, including one of our very favorites “The Last Mughal”. The lecture was about his new book, due to come out early next year. It is entitled “Return of the King”. It is about the British Afghanistan wars of the 19th century. He is a fantastic storyteller, and this unbelievably bloody history of military adventure in Afghanistan is extremely relevant today as the same mistakes are repeated. 18,000 British solders went into Afghanistan, 1 returned! Dalrymple has found amazing documents in Kabul, Afghanistan and has woven a dramatic story. I can’t wait for the book to come out. America today is almost exactly repeating the errors the British made. When I met him over lunch, I asked him if the last word of the book will be the word “China” and he said yes!, History will repeat itself again. At lunch we were seated at a table and the author of several books about the occupation in the Palestinian territories sat down next to us. We had a great discussion and I plan to buy several of his books. It amazes Cathy and I the interaction between major authors and the attendees. I can’t think of any other event I have ever been to where the participants and the panelist intermingled like this – there is no reserved space for the speakers. If they want to attend a panel or eat lunch they get in line like everyone else. It is very democratic. We then attended an enlightening lecture by Richard Dawkins. This absolutely brilliant scientist, and militant atheist, presented argument after argument against the existence of God and the damage caused by religion. Being atheists we ate it up, and the audience, composed of secularist, Muslims and Hindu’s were enthralled. Like each session it ended with audience questions and it was great listening to his responses, either in rebuttal or agreement with the questioner. We then went to a very crowded event and decided to leave early. We literally stumbled into a wonderful colloquy by a renowned reporter (a Walter Cronkite kind of guy) who covered everything from the Ghandi assignation onward. His bottom line was that the youth must fight for better government, news reporters should always be against the establishment. His wisdom was manifest as discussed almost the entire history of the Indian Nation since 1947. He has seen it all. Because the Rumi session was moved from 3:30 there was a gap of time when the Great lawn (the biggest of all venues) had no planned activity, but we decided to go there early to secure seats for the final panel a discussion on the proposition: “Has Man Displaced God”. However when we arrived there, the place was jammed with thousands of people and their was a definite tension in the air. Increased security was also evident. The organizers of the event appeared in a tearful speech, explained that they hoped to have a video linkup with Salmon Rushdie, but the threat of violence prohibited it. Apparently militant fundamentalist were gathering in parks nearby to disrupt the conference and some were already in the audience. Everyone was very upset and nervous. The organizers then decided to have an ad-hoc panel on the issue of fundamentalism and the necessity to not allow Rushdie to speak or appear for fear of danger. It was absolutely amazing. Most of the panelist were appalled that they had to give in to the fundamentalists and not allow Rushdie to be heard. However one of the panelists was a Muslim fundamentalist leader. He was straight out of central casting, an archetype of every Muslim militant you have ever seen on TV. With a smile, he speaks of the peacefulness of Islam while explaining why Rushdie could not be allowed to speak. It is critical to remember that the book “Satanic Verses” is banned in India, but Rushdie is not, and he is free to come and go. We have seen on TV and in movies this type of fundamentalist but never experienced it in the flesh. As he spoke certain elements in the crowd would clap approval or boo in disapproval. It was an incredible experience for us. India has multiple religions, castes and ethnic groups with strong, yet ambiguous laws protecting their sensibilities. Free speech is very much in conflict with perceived insults and is curtailed. After this very emotional ad-hoc panel concluded it was obvious no ones mind were changed, but all had a chance to speak. The final panel of the conference was a debate about the general proposition: “Has Man Replaced God”. 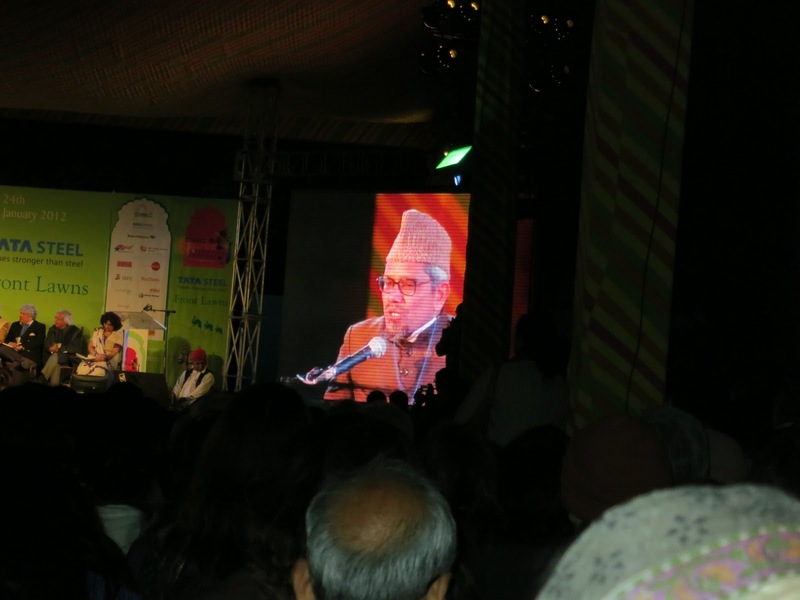 They always end the JLF with a debate featuring some of the noted panelists. Because of the overwhelming secular humanism of the attendees the sympathy of the majority of the crowd was definitely against God. We of course agreed. The fundamentalist, a Swami, and very devout Muslim British women defended religion and a belief in God. Once again, no ones mind were changed. Interestingly because of the relative tiny Christian population and almost non-existent Jewish population these religions were not even mentioned. I can’t conceive of a discussion like this taking place in America. Here in India where religion and religious identity is important, it is perfectly ok, to be extremely critical of religion and a belief in God. In America, I think that discussions like this at major public event would never happen. India is a country made up of various religions, castes, tribal peoples and languages. The fundamentalist issue is huge (both Hindu and Muslim fundamentalist). Violence is a tactic used by both groups against perceived and real threats and insults. Every year or so in India there are violent inter-communal clashes leading to injury and deaths. Caste discrimination though illegal is still prevalent. The large intellectual community of which this gathering was representative is caught in the middle. There was much discussion of the role of the media in giving microphones to these extreme elements. In spite of these difficulties the country is a thriving democracy with institutions (corrupt and as inefficient as they might be) striving to perfect themselves. 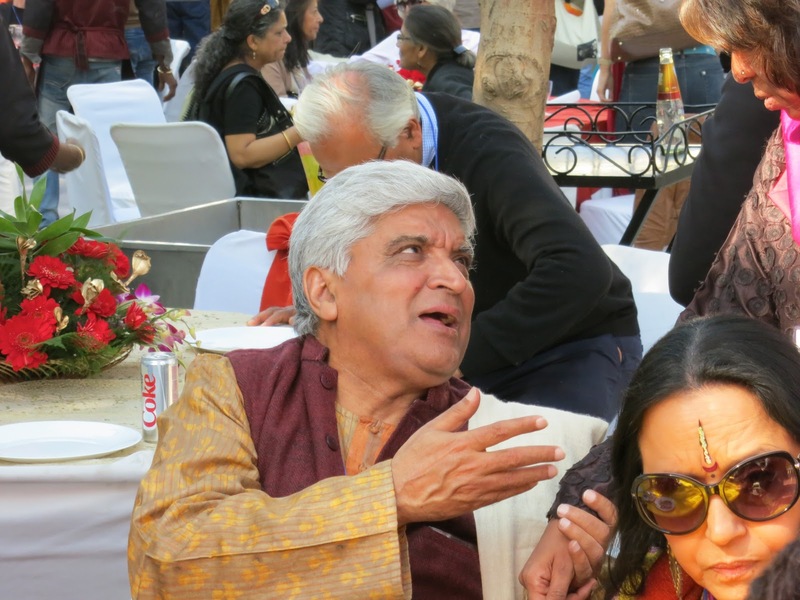 The Jaipur Literary Festival was a fabulous 5 days for us. We have a ton of books we want to read, that we would never have known about if we hadn’t attended. There are issues of Religion, Politics and History we want to follow-up on. We are extremely happy we attended the event. I don’t understand how what you say in (1) can be true, if what you say in (2) and (3) are true. "(1) I can’t conceive of a discussion like this taking place in America. Here in India where religion and religious identity is important, it is perfectly ok, to be extremely critical of religion and a belief in God. In America, I think that discussions like this at major public event would never happen." 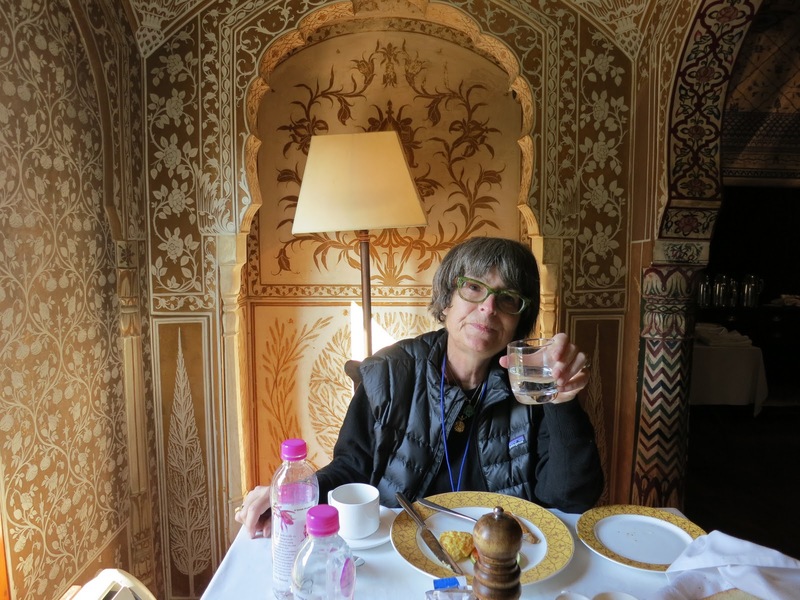 "(2) It is critical to remember that the book “Satanic Verses” is banned in India." "(3) The fundamentalist issue is huge (both Hindu and Muslim fundamentalist). Violence is a tactic used by both groups against perceived and real threats and insults". Do share your suggested reading list! Glad you enjoyed the festival so much. Cliff - terrific reports from the 'front'. The Jaipur festival is now officially on my bucket list. Can't wait to hear even more about it. Discussions like this certainly are held in public events in the U.S., though perhaps not in "major" ones.